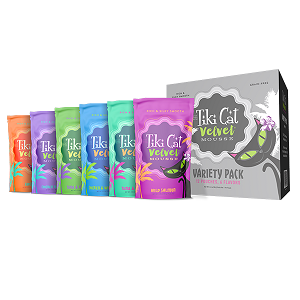 Tiki Cat® Velvet Mousse™ Variety Pack Cat Food | All Things Woof Meow, Too Inc. Feeding the same thing every day? Booooring. Mix it up! The Velvet™ Mousse Variety Pack gives you six different, delicious formulas to thrill your cat at every meal. By switching up their routine, you can prevent them from becoming picky eaters, while giving them a variety of protein sources and nutrients. Pet parent win! The Velvet™ Mousse Variety Pack contains 12 2.8-oz. pouches of the following formulas (2 of each): Chicken, Chicken with Egg, Chicken & Wild Salmon, Wild Salmon, Tuna & Chicken and Tuna & Mackerel.